The fall 2017 exhibition in the gallery@calit2, Speculative Dolphin Theatre, opens on October 5, featuring a reception and panel discussion with artist and MFA candidate Lisa Korpos. The panel, including UC San Diego cognitive-science lecturer Christine Johnson, and UC San Diego communication and visual arts professor Lisa Cartwright will be moderated by UC San Diego visual arts professor Jordan Crandall. The exhibition is open to the public, free of charge, weekdays from noon to 5pm, and it runs from October 5 through December 8, 2017 in the gallery@calit2 on the first floor of Atkinson Hall. In collaboration with the Department of Cognitive Science and the Dolphin Cognition Lab, both at UC San Diego, the artist and the cognitive scientist have created the exhibition Speculative Dolphin Theatre as an immersive video and sound installation. "The installation explores dolphin communication, mimesis and nonhuman subjectivity," explains artist Lisa Korpos, a 2nd-year MFA candidate in Visual Arts at UC San Diego. "Varying underwater perspectives of dolphins are projected on three adjoining walls of the gallery for a synchronized recreation of the real-time experience of the dolphins’ movement and activity — generating the sensation of being in the pools with them." Layered on top of the video projections are speculative, spoken-word interpretations of the dolphins’ interactions with one another, emitted through three sets of corresponding stereo audio channels. Several scripts play sequentially — each synchronized to the same looping video segments to generate a multiplicity of potential narratives or situated perspectives on the part of the dolphins. 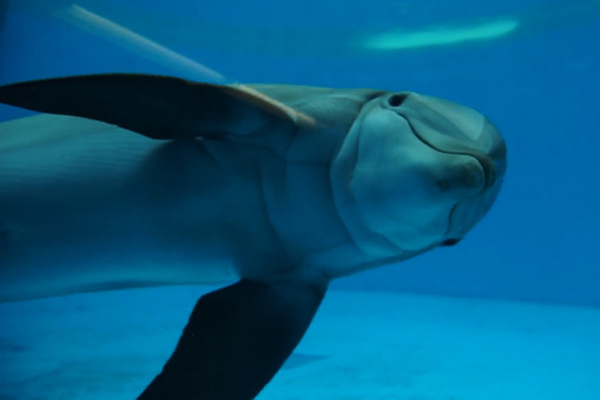 The underwater video segments come from original recordings of seven bottlenose dolphins at the Bookfield Zoo in Chicago. In addition, the spoken-word scripts are scientifically credible. They draw on behavioral patterns discovered in the lab through multi-scalar analyses of dolphin interaction. Adds Korpos: "The scripts are also creatively synthetic, drawing from strategies in literature and the performing arts to generate a speculative fiction based upon the enigmatic interplay of these flippered, aquatic individuals." Korpos depicts a potential nonhuman subjectivity concerned with day-to-day, underwater social dramas through this examination of delphinid communication. The artist also seeks to highlight the "complexity, ambiguity, and problematics intrinsic to performing observational animal research." 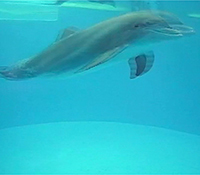 The Dolphin Cognition Lab conducts moment-by-moment video and audio analyses of real-world interactions between socially-sophisticated animals to uncover behavioral patterns within these dynamic, distributed systems. Artist Lisa Korpos uses digital media, performance, and environmental intervention to destabilize anthropocentrism. "My work explores the multiplicity of forms that sentience has taken across the animal kingdom," she notes, "along with the vulnerability we all share as embodied, corporeal creatures." Grounded in both science and fiction, Speculative Dolphin Theatre illuminates the myriad potential explanations for animal behavior that cognitive ethologists contend with as they perform their research, and the exploration is carried out through the lens of a speculative theatre that adds a literary, cross-disciplinary and performative perspective. As a dolphin approaches the glass viewing window, she makes eye contact -- imploring the viewer to acknowledge her. "With this confrontation, the viewer ceases to be a passive observer," observes Korpos. "The glass screen becomes the surface where your world and the dolphin's collide, a site of spectacle, speculation, surveillance and voyeurism." Lisa Korpos​ is a San Diego, CA-based new media artist and second-year MFA candidate at UC San Diego. By borrowing from disciplines as disparate as the visual arts, cognitive science, and critical animal studies, she seeks to articulate an animal phenomenology — how sentient experience manifests across the animal kingdom. Although her work is largely informed by research on the sensory capacities of nonhuman animals, it is a lo-fi (often speculative) reverse-engineering of this research, manifesting in audio/visual media, performance, collaborative sculptures, and environmental interventions. Her aim is to generate objects and experiences that teeter at an intersection between worlds and perspectives — not quite belonging to us, nor to the animals.